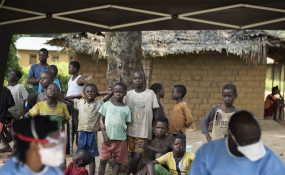 On June 20, 2018, a group of people observed an Ebola vaccination campaign in the village of Bosolo, in the Democratic Republic of Congo. Suspected cases of Ebola have been reported in North Kivu, eastern DRC. After seeing first-hand the complexities of the Ebola response in the conflict-affected region of North Kivu in the Democratic Republic of the Congo (DRC), the Head of the World Health Organization (WHO) called for "free and secure" access to the disease-affected people. "All of those participating in the response must be able to move freely and safely in conflict areas to do the work that is needed to bring the outbreak under control," said Dr. Tedros Ghebreyesus, WHO's Director-General. "The population must also have access to treatment centers that save lives and stop the spread of disease." While this is the country's 10th Ebola outbreak, it is the first time that the disease has struck a densely populated active conflict zone. As was done in the recent outbreak in the west of the country, WHO is supporting the Ministry of Health in key aspects of the response. "WHO has vast experience with delivering health services in conflict zones in Africa," said Dr. Moeti. "We will build on this experience to ensure that our staff and partners can do their work and save the lives of the people we are here to help." On Wednesday, health responders in DRC launched a vaccination campaign to mitigate the risk of spread of the disease.